Beautiful get-away in the country! Nestled on the Eastern flanks of Heart Mountain, this cozy and comfortable home is sunny with lots of windows to enjoy mountain views! The ranch includes horses and wild life that frequent the area. 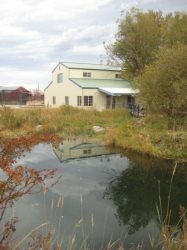 Close proximity to Cody, Powell, Yellowstone, Red Lodge, skiing, hunting and all outdoor recreation. Horse boarding is also available for people traveling with horses. Clean, well mannered dogs on leashes will be accepted. Sorry we do not allow kitties! This home is available for daily, weekly, monthly or longer periods. Come stay, rest, and rejuvenate your soul in the shadow of Heart Mountain. Please note: pricing is based on an occupancy rate of four guests. Additional guests are $10 per person, per day. Total Sleeping Capacity: 7 Max. Note: boarding for a single horse is available for short-term stays only. No stallions and additional fees apply. Contact us for more information. Very quick in responding to my multiple inquiries! The host Wanda & Jim were AMAZING! Wanda greeted us when we arrived and gave us a tour of the house. Jim gave us wonderful tips and information for our trip to Yellowstone that helped us since it was our first time there! Wanda & Jim are the best and most welcoming, friendly couple! They even offered to give my son a ride on one of their beautiful horses, which of course my son LOVED the idea of, but then chickened out, so we never got to take them up the wonderful offer! The house was very clean and plenty of space for our small family of 3 and our 2 dogs! The view from the property was BEAUTIFUL! Would not mind staying here again as Wanda and Jim are AMAZING! Very helpful when booking this time. We really love the bunkhouse we stayed in. It was so nice and quiet and the location was perfect. Not too far out of town and not too far in town. Jim,Wanda, and Carl were so wonderful! They went above and beyond making us feel right at home. From providing us a nice breakfast the morning we had arrived to checking on us in the evenings to make sure everything was going good with our stay. Sadly we didn't have much time to get to know them better we were always on the run trying to cram two weeks of sightseeing into 4 days. I recommend this place highly and the people who own it or absolutely wonderful! It was great ! No problems at all! The owners of the property we absolutely amazing! We plan on going back there for future trips! Absolutely wonderful! Best vacation ever!!! Very home like! Cozy, with beautiful view. We loved the property! The view of Heart Mountain was beautiful. Wanda, Jim, and Carl were wonderful, and a friendship was formed! It was very quiet and peaceful. Will for sure go back!! Cody Lodging and the property owners were amazing! Heart Strings was everything and more than we hoped for! Jim and Wanda were excellent!!!!! The view at this property is wonderful! We loved our almost 4 month stay and we WILL be back! - The purchase of a $39 damage insurance policy provides $3,000 in damage protection during your stay. You may decline this charge, but may be assessed a minimum $250 deposit.